Website editor’s note: The information below is sourced from the latest newsletter from the Australian Vaccination-risks Network (AVN). NB: This is the same organisation formerly known as the Australian Vaccination-skeptics Network and originally as the the Australian Vaccination Network. The Australian Vaccination-risks Network, Inc (AVN), a national consumer health organisation which has operated in Australia for nearly 25 years, wants to know the answer to this question as do its members and the tens of thousands of its Australian supporters. Above is a billboard which the AVN has erected in Brisbane, QLD for International Vaccine Injury Month (October, 2018). Our intention is to remind parents that there has never been an independent, large-scale study comparing the overall health of the vaccinated vs the unvaccinated despite the fact that children receive up to 8 vaccines in one visit and a large number of acute and chronic conditions have been linked with the administration of vaccines. Today, Australian children are receiving up to 54 vaccines by 5 years of age (more, if they are given annual flu shots) yet there has never been a study of the overall health of fully vaccinated vs fully unvaccinated children. In 2013, Dr Peter McIntyre, then head of the National Centre for Immunisation Research and Surveillance (NCIRS) promised on national television that such a study was already in the works. Five years later, despite GIPA requests and unanswered letters to the NCIRS, we are still waiting to find out if it’s started. But small independent studies around the world have produced results indicating that the vaccinated are much less healthy than their unvaccinated peers. 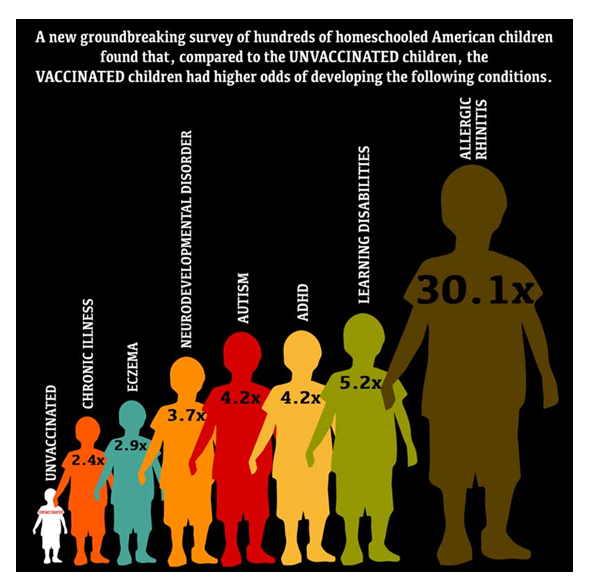 As you can see, there is a huge difference in the health of those children who were vaccinated vs the unvaccinated. Parents need to be aware of this information and allowed to make choices without the risk of discrimination, financial penalties or bullying from the medical community or the government. ‘Note from editor of www.naturalmedicine,net.nz: Parents wanting to make an informed decision about vaccination should read the Mawson study (am ong other relevant information such as vaccine datasheets), The above graphic provides information only on chronic conditions; the Mawson study showed that unvaccinated children were more likely to have had some acute illnesses such as pertussis (whooping cough) and chickenpox. “The government is discriminating against and penalising informed parents who have chosen not to vaccinate according to schedule.” Says Meryl Dorey, AVN President. “Yet they are refusing to do the one study which will put parents’ minds at ease when it comes to concerns about vaccine safety – a study comparing the health of the fully vaccinated vs the fully unvaccinated. The AVN has published fully-referenced information on this issue at this link on their website. The NZ Journal of Natural Medicine is a quarterly magazine that covers a wide range of topics of interest to people who are interested in enjoying good health, including treatment and prevention options for many different conditions, with articles about vaccination featuring regularly. (We also had articles about various aspects of vaccination on this archive of our website,.) The Journal also includes information about nutrition, potentially harmful chemicals and unnecessary exposure to ionising and non ionising electromagnetic radiation.